Hi, I am hoping that you can give me some assistance in how to get the webcam feature to work on MSN Messenger for Macs. I was assured that before I bought my Mac that MSN Messenger works as it does on my old PC. It mentions about being a corporate user and the webcam function working. How do I become a corporate user? If you could get back to me as soon as you can with a solution it would be much appreciated. I really feel for this user because converting to Mac can be a frustrating experience at first and stupid things like this can really make you wonder whether it was worth all the bother. It’s ridiculously unfair of Microsoft when PC users can use webcams and audio with MSN Live Messenger but Mac users can’t. Microsoft have obviously decided that, if you’ve got enough money to buy a Mac, then you should have enough to give them some too because as the user suspects, only Messenger for Mac corporate users can use a webcam. If you’re in the same position you have two options. One is to pay hundreds (if not thousands depending on the license) of dollars and upgrade to the corporate edition which also requires Microsoft Office Communications Server 2007. The second, is to use pay nothing and use aMSN instead. Hmm, tough one. 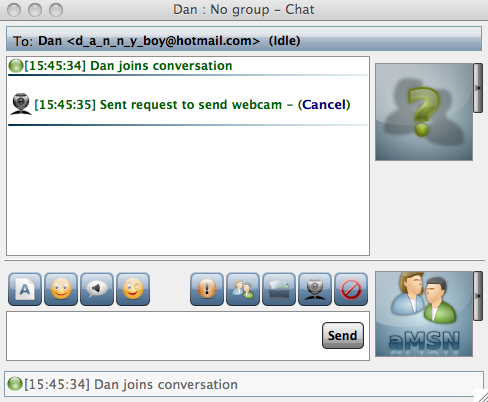 aMSN is an open source MSN Messenger clone so its interface will feel familiar to Messenger for Mac users. The important thing however is that it’s absolutely free and it supports webcams. Starting a webcam conversation is easy. That’s it you’re done! I was using an integrated iSight camera but it should work with any external webcam. Although you can’t do audio conversations with aMSN, you can record and send sound bytes to other users. There are other advantages to aMSN over Messenger for Mac too including the possibility to sign-in to more than one account at once and conduct video conferences for free.